EMDR (Eye Movement Desensitization and Reprocessing) is a type of therapy that enables people to heal from the distress and ongoing symptoms that can result after experiencing trauma. Repeated studies show that by using EMDR clients can streamline the therapy process; EMDR therapy enables individuals to experience the benefits of years of psychotherapy in a much shorter amount of time. One study*, focused on sexual assault victims, found that 90% of PTSD sufferers exhibited eliminated symptoms after only 3 sessions of EMDR. The American Psychiatric Association, the World Health Organization, the Department of Veteran Affairs, and the Department of Defense all recognize EMDR as one of the most effective treatment for trauma and other disturbing events. Read more about EMDR Psychotherapy: What is EMDR? 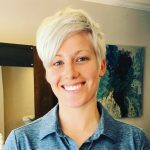 Kayla Burningham, AMFT is an EMDR certified therapist, and specializes in helping clients overcome the trauma from their past. Contact our office to speak with Kayla and learn more. *Rothbaum, B. (1997). A controlled study of eye movement desensitization and reprocessing in the treatment of post-traumatic stress disordered sexual assault victims. Bulletin of the Menninger Clinic, 61, 317-334.